Chicken Collage Day 5 (Aug 31 2011), a photo by randubnick on Flickr. 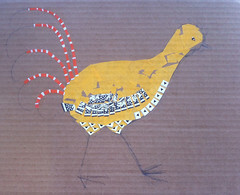 I got up early and went to the studio for an hour to work on this collage, an image of a chicken done in patterns. Although I am far from finished with the body of the chicken, I had an idea for making the tail-feathers, and I decided to try it out. I started by laying down the basic lines in orange and white, cutting the pieces out of a paper bag (from the local Unleashed by Petco). I cut little strips of orange and white, and pasted them down in a loose pattern. My idea is to finish the lines of the tail in orange and white, and then suggest some "feathers" with a black and white pattern cut from the Arches watercolor pad. (I tried out a few pieces but didn't paste them down because I want to finish the orange and white lines first, but I decided the idea would work.) So today I went as far as I could until I ran out of orange. I will have to get another paper bag. Well, we are regular Petco customers anyway, but now I am suddenly eager to buy a box of dog treats! 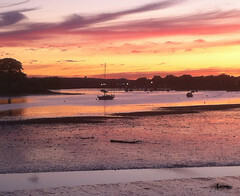 Sunset and Low Tide, a photo by randubnick on Flickr. 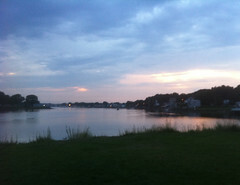 This is a photo that I took last night during an after dinner walk at Obear Park, here in Beverly, MA. These walks become almost routine during the summer, something I do several times a week, but the sunset is always different, and last night, it was anything but routine. The tide was low, the sky was purple, and even the sand became pink. Tonight I used iPhoto to crop this image, but apart from that, this is just as it came out of the camera. Chicken Collage Day 4 (Aug 29 2011), a photo by randubnick on Flickr. This morning I went up to the studio to restore it to "pre-storm" condition. (On Friday I closed all the windows and took stuff down from the walls and tucked things away just in case.) 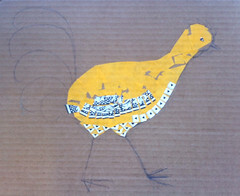 After the studio was back to normal, I got to work on this little collage, an image of a chicken made up of patterns. (I got this idea looking at some real live chickens over at Long Hill Gardens a couple of weeks ago.) I closed up gaps on the chicken's body with pieces of yellow paper and also used yellow paper to make the shape of the legs. Then I added black and white pattern to the legs. The geometric shapes come from a chart that I found on the flip side of the cover of an old watercolor pad. I had black squares on white rectangles, but I cut them in half to make the triangles that I used on the legs. I was having a great time, but I had to stop for today. Dad's Grade 8 Graduation (PSTR), a photo by randubnick on Flickr. My dad was born on August 28, so today would have been his birthday. Last night I was looking through some early photos of him that my Aunt Celia gave me after he died. One of my favorites has always been a picture of him holding his eighth grade diploma. 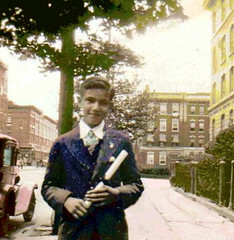 (On the back of the photo, someone wrote: Hy Zagon, 8th Grade Graduation, 1932.) This morning, despite the stormy weather, I decided to try to do something with the snapshot. I scanned it into the computer and took a good look. The snapshot was great to start with, but it wasn't straight. And I saw some problems that I hadn't noticed before because I liked the photo so much. There were several people in the background and I didn't necessarily want to include strangers in this picture. There were garbage cans lining the sidewalk, but what was worse, there was garbage strewn along the sidewalk. So I decided to clean up the streets of Brooklyn for my dad. I usually start by straightening the image, but this time I waited because I wanted to preserve as much as of the original as possible. I used a combination of cut-and-paste and digital chalk to cover up the people and the garbage cans. In the process, I had to "invent" part of a facade and rebuild a sidewalk, fence, and curb. This took a while. Then I used color overlays and posterizing to add the color. I am simplifying here because it took a lot of tries to get what I wanted. After that I used iPhoto to straighten and crop, and finally used the iPhoto "retouch" tool to soften some edges. It felt good to spend a little time on this, thinking about this little boy who grew up in Brooklyn, and years later moved to Pueblo, Colorado, where he met my mom, got married, and became my dad. Chicken Collage Day 3 (Aug 26 2011), a photo by randubnick on Flickr. Yesterday I made a quick trip up to the studio. I needed to get all the windows closed because of the expected storm. I couldn't stay long, but while I was there, I worked on this collage for a little while. 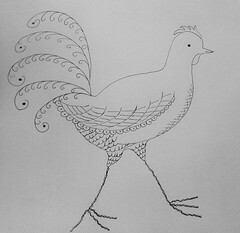 This is going to be an image of a chicken done with patterns. 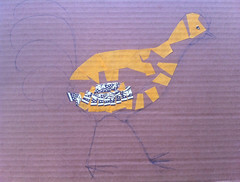 I used more of the yellow paper to fill in the body shape of the bird. I am pasting black and white pattern over the yellow, and yesterday added a few more pieces, trying to suggest feathers and wings. Chicken Collage Day 2 (Aug 25 2011), a photo by randubnick on Flickr. 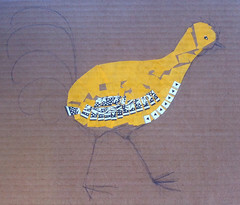 Yesterday at the studio I worked on this collage, an image of a chicken made up of patterns. I pasted some more yellow paper down, and wanted to add some more pattern. The black and white pattern on the wing comes from the border print on the bright green cover of an old watercolor pad; printed on the other side, I found a black and white chart which I am using for the second pattern (black triangles on white squares). Now I am beginning to think my idea is going to work. Chicken Collage Day 1 (Aug 24 2011), a photo by randubnick on Flickr. 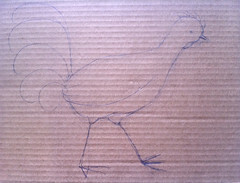 Yesterday I went up to the studio and started this little collage of a chicken. Last week I saw some chickens at Long Hill Gardens and the patterns in their feathers put an idea in my head: an image of a chicken made up of pattern and texture. So I made several sketches, and moved on to this collage. Yesterday I posted the pencil drawing on the cardboard that I am using for a base. But I also started pasting down paper, and here is how my collage looked when it was time to quit for the day. It was easy enough to find this yellow paper in my collage bin. The black and white pattern was a little harder, but I decided to use the border print from the edges of a water-color pad. This isn't exactly like the image I have been seeing in my mind's eye, but when I started pasting down the black and white pattern, I felt like I was beginning to get somewhere. In any case, I had fun and a little comic relief, because this little chicken makes me laugh. To be continued. . . .
Chicken Collage (Pencil Sketch), a photo by randubnick on Flickr. This afternoon, I went up to the studio, and got started on a collage I have been thinking about. This is based on a little series of chicken drawings I have been making recently, inspired by some beautiful chickens that I saw at Long Hill Gardens, in Beverly. I loved the patterns and colors in their feathers, and seeing them gave me an idea for an image of a chicken done with patterns, so I decided to do a collage. I began with this pencil sketch on cardboard. I drew based on memory this time, but made lots of corrections. When I was nearly done, I took a peek at my previous sketches (using my iPhone), and made some slight adjustments. Then I took this picture with my iPhoto. Afterwards I kept going. I started making the collage, cutting paper and pasting pieces onto this drawing. I plan to post that here tomorrow. It seems silly to pay so much attention to an image of a chicken. Well, I could justify this by saying "it's good practice" (it is), or "I am interested in patterns in nature" (I am). But the truth is that sometimes art is just plain fun, and these days I think everybody could use a little comic relief! Anyway, today I was very glad to be back in the studio, hatching out this little project. Spectacular Sky, a photo by randubnick on Flickr. 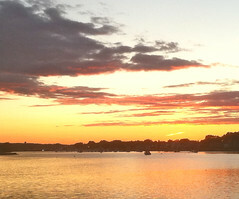 This is one of the photographs that I took tonight during (another) after dinner walk at Obear Park, here in Beverly, MA. This is a great place to see the setting sun because there's a clear view of the sky and water to the west. I have taken a lot of photographs there, so why take another one? Well, the sunset is different every time, and tonight the sky was spectacular, so I pulled out my camera as the clouds turned neon pink. Back home, I used iPhoto to crop this image and adjust the shadows just a bit. Another Chicken (Sketch with Woodcut Effect), a photo by randubnick on Flickr. This is the pen-and-ink sketch that I posted yesterday, but with some post-production work. Tonight I used Painter to adjust brightness and contrast, and then applied a "woodcut" effect to strengthen the lines. 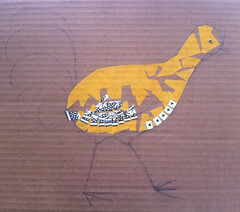 That's about as far as I can take this little chicken, but I am still thinking about a collage or applique. Another Day Another Chicken, a photo by randubnick on Flickr. This morning I went up to the studio at Porter Mill. I spent most of the time putting things away and hanging some art on the walls. By the time I was finished, it was really hot up in the studio, but I didn't want to leave without making art. So I decided to give the chicken drawing another quick try. (I have been inspired by some mighty fine chickens that I saw during a recent walk at Long Hill, and decided I wanted to draw them. See last night's post for my first try.) I want to play with the textures and patterns that I saw when I looked at those amazing little chickens the other day. I have a vague image in my mind's eye, but so far can't get it down on paper. Well, I have been wondering whether what I need to do is a collage or applique, and in fact, this morning I started looking through my collage materials. But I knew I didn't have time for that this morning, so I decided to just try a quick sketch of a chicken to see what would happen. I got out a sketch pad and what I thought was a black sharpie, and began to draw. Well, the sharpie turned out to be blue, but I couldn't find a black pen, so I kept going. I drew this bird from my imagination and memory, in one go without looking at any reference materials. Even though my sketch is not exactly anatomically correct (proportions are off, for one thing), I was more playful with the lines and textures, and in that sense, I liked this drawing better. Tonight I transferred the image into my computer and through the magic of iPhoto, transformed it into black and white. I also plan to turn this little drawing into a digital woodcut in Painter, and if that works, I will post that tomorrow. 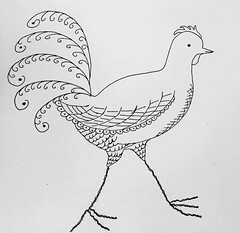 Eventually I plan to try a version of this idea as a collage or fabric art project. . . .
Little Chicken (Pen and Ink Sketch), a photo by randubnick on Flickr. This is a pen and ink sketch that I drew tonight. 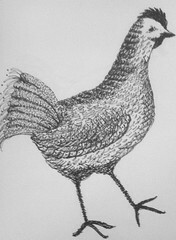 It that was inspired by some chickens that I saw today during a walk at Long Hill Gardens. There were lots of different kinds of chickens to see, and the textures and patterns in their feathers were amazing. Although I did try to photograph the chickens, they were not interested in having their pictures taken, and I am not sure I got very good results. Afterwards, an idea for a pen and ink drawing popped into my head and wouldn't go away, so after dinner I gave up and grabbed a sharpie and a sketch pad. I started drawing from memory, but also looked at my photos for reference (still in the iPhone). I made some pretty big mistakes and had to start over. On the second attempt, I checked the chicken anatomy against some images of chickens on Google and made a few corrections. Then I started to play with texture and pattern, which was the original idea I had. Afterward, I photographed my sketch and used iPhoto to crop it to get this composition. It was good practice to do this drawing, I think. But the result was less playful than I wanted it to be, less stylized than the drawing I was imagining. Well, maybe I needed to attempt this (somewhat) realistic drawing first. I will try again later this week. . . .
Seven-Thirty Sky, a photo by randubnick on Flickr. This is a photograph that I took tonight at Obear Park, here in Beverly, MA. I called this picture "Seven-Thirty Sky" because in the summer, dogs aren't allowed in waterfront parks until 7:30 pm, so that's when we usually take a walk by the water. (Actually, according to iPhoto, I took this picture at 7:39 pm.) Anyway, the added bonus of these evening walks is seeing the seven-thirty light show, in the sky and on the water. Swiss Chard in the Field, a photo by randubnick on Flickr. Today's adventure was a trip out to the Food Project at Longhill Gardens here in Beverly, MA. The Food Project is a CSA (Community Supported Agriculture) and paying for a membership means a weekly haul of lettuce or cucumbers or squash or whatever is available. In addition to the food arranged in bins under a tent, there is usually a chance to pick herbs and whatever else is available. 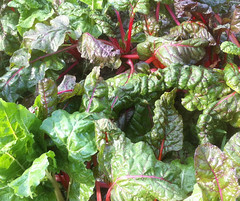 Today it was cherry tomatoes, but to get to them, I had to walk along a long row of Swiss chard. When I realized that I was admiring the beautiful colors of the Swiss chard, I stopped and took out my iPhone camera and got a couple of pictures. Tonight I edited this one in iPhoto. Grasses and Pond, a photo by randubnick on Flickr. I was looking through my photos tonight and found this one. I took this picture in early July during an evening walk at the Cummings Center Pond here in Beverly, MA. (This is also known as Shoe Pond.) 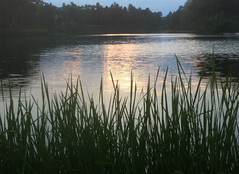 I liked the evening light and the contrasting textures of grasses and water, which is why I took this picture. 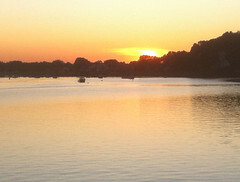 I don't know why I didn't post it before, but here it is, just straightened and cropped tonight in iPhoto. Galia Melon, a photo by randubnick on Flickr. This week the grocery store ran specials on some unusual kinds of melon, so I decided to try this one. From the shape of the melon and the texture of the skin, I thought I was buying a kind of canteloupe. But the skin was orange instead of green. And when I cut into it, the fruit was green instead of orange. It kind of looked like an inside-out canteloupe. It tasted good (but not quite canteloupe) and looked pretty enough for a picture, so I used my iPhone to take a couple of them. Tonight I edited this one in iPhoto and cropped it to get this composition. I also did a little research on Google and found out that this is a Galia melon. 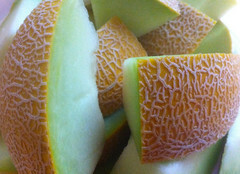 It is a hybrid between canteloupe and honeydew, original developed in Israel in the 1970s, but now grown in a number of countries, including Brazil, Spain, and the southern U.S. Many Ribbons (Posterized), a photo by randubnick on Flickr. 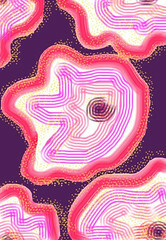 This is the third of three images that I made the other night when I was making a new pattern in Painter. To make this image, I used Painter's pattern pen and my new Zigzag Ribbon pattern (posted here yesterday and the day before). I used a blue background and chose a pastel "pattern pen" loaded with purple pastel. 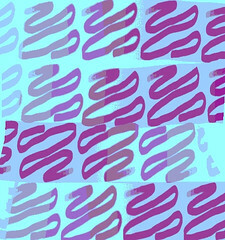 I used a big "brush" and made a few strokes, though I spent a few minutes in over-and-over land to get the pattern where I wanted it to be. Then I posterized the image, and cropped it to get this composition. This process kind of reminds me of making monoprints, and the results look like prints too, which is why I think of these as digital prints. Red Ribbon Pattern, a photo by randubnick on Flickr. Yesterday I created a new pattern to use with my Painter program. 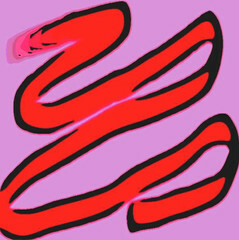 I started with a little drawing, almost a doodle, created it with Painter's "digital felt-tip pen" in red. Then I used the woodcut effect for the black outline, and a color overlay to get the lavender. Once I had created the little drawing (posted here yesterday), I "captured" the image to use as a pattern. 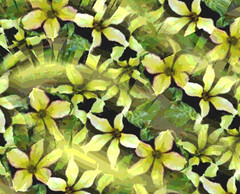 Then I used my new pattern to create this simple image, just to see how the pattern would look. Zigzag Ribbon (For Pattern), a photo by randubnick on Flickr. I love my Painter software, and have been an enthusiastic user for over twenty years. One of my favorite features is "capture pattern," which allows you to instantly create a pattern from either a photo or a drawing. But unfortunately, every time I upgrade the program and/or upgrade my operating system (which I did recently), I lose some of my captured patterns. (If anybody out there can tell me how to remedy this, please help!) But of course, I can always make more. Tonight I decided to make a new pattern, something abstract. So I used a bright red "digital felt tip pen" to make a zig-zag line within a square format. This little gesture is so simple that it is more of a doodle than a drawing. Then I used the "woodcut effect" to get the black outline, and added a color overlay in lavender. And that was it. 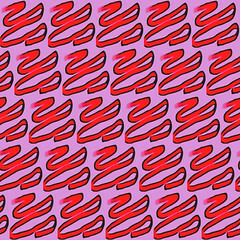 After that, I used this new "Zigzag Ribbon" pattern to make two more images, which I plan to post tomorrow and the day after. Another Sunset, a photo by randubnick on Flickr. 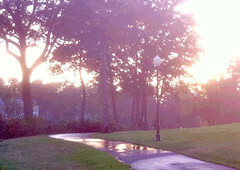 This is a photograph that I took tonight during another evening walk at Obear Park, here in Beverly, MA. This is a great place to see the sunset because it is one of the few places around here where you can look west over the water. I have seen a lot of sunsets there, but each one is different. Tonight the water looked blue and orange at the same time, reflecting the bright colors of the setting sun. I did a little straightening and cropping in iPhoto, but apart from that, this is the image just as it came out of my iPhone camera. Summer Still Life (Hand-Picked Tomatoes), a photo by randubnick on Flickr. Today's adventure was a trip to the Food Project (CSA or Community Supported Agriculture). Here in Beverly, this is located in a big field at Long Hill Gardens. In addition to the bins of produce under a tent at the edge of the field, there are usually additional herbs or vegetables available for picking. So today I went out to the field to pick cherry tomatoes. Now, it isn't always easy to find the tomatoes among the tangle of tomato vines, but I just looked for orange and red among the green leaves. I am a big fan of color and think of it as tool for making art, but it was good to be reminded that color has more basic uses, such as making it easier to find food! 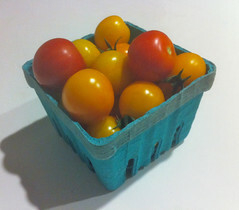 I had two pint boxes to fill, and I liked the way the red and orange tomatoes looked against the blue cardboard. That's when I decided to take a photograph, but it had to wait until I got home. After dinner, I took this picture with my iPhone. Then I used iPhoto to do a bit of retouching, and cropped the image to get this composition. Soft Roses, a photo by randubnick on Flickr. Tonight I made digital image with my Painter software, using a pattern pen and a pattern that I created from one of my photos of a rose. I used a transparent pattern pen on a peach background, and made just a few strokes, keeping them all in the same direction. I posterized the whole image. Then I used a pink color overlay, and chose "luminosity of original image", which created a kind of glowing effect (which I actually tuned down a bit). 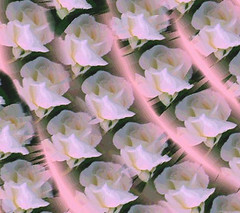 Then I cropped this image and this is the result. Reflections on the Path (Posterized Photo), a photo by randubnick on Flickr. This image began with a photo that I took last night during a walk at the Cummings Center Pond. There were lots of great things to see--flowers blooming, ducks on the water, setting sun--but it was the path that caught my eye. I knew that this shining path was just the effect of the setting sun reflected on the asphalt, which was wet from a recent rainstorm. But it looked magical to me, so I took some pictures. Tonight I edited the best of them in Painter. I adjusted the contrast and brightness, and then posterized the image. I also used some color overlay to restore color to the sky (lost because the light was too bright for the camera.) To finish, I used iPhoto to straighten, crop, and retouch. Apricots (Posterized Photo), a photo by randubnick on Flickr. 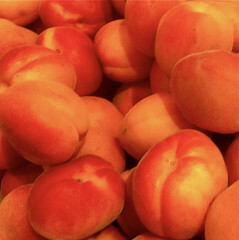 Yesterday I posted my photo of apricots, taken during a recent Whole Foods run. I have been wondering how the photo would look posterized, so tonight I opened the image in Painter. I started by adjusting the brightness and contrast, which also resulted in better color. Then I posterized the image, using trial and error to get the right amount of posterizing effect. 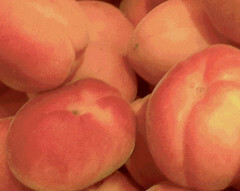 The posterizing makes the apricots look soft and fuzzy, like, well, like apricots! Then I started cropping until I was happy with the composition. And here it is. Orange and Red Apricots, a photo by randubnick on Flickr. This is a photograph that I took this morning during a Whole Foods run. I stopped what I was supposed to be doing to admire some beautiful little apricots, pale orange tinged with red. So I decided to take a couple of pictures. Tonight I edited this image in iPhoto, trying to get the color just right. I also did a little retouching and then cropped several times to get this image. Beans Revised, a photo by randubnick on Flickr. 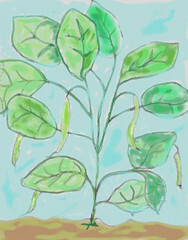 Tonight I thought I would try to digitally revise my little pen and ink drawing of a bean plant. (See posts for yesterday and the day before.) I thought maybe I could get the leaf shape to be horticulturally correct. (I should say, however, that I did find some pictures on line of bush bean plants with a leaf shape that looked somewhat like the shape in my drawing. )Anyway, I opened the jpeg of the drawing in Painter and got to work with digital pastel, and I was able to change the lines and re-draw the leaves. But the background was textured, so I was going to have to cover it all with digital chalk (in gray, to match the background.) I got started, and it was working. But it wasn't much fun. So I decided that if I was going to cover the whole image anyway, I might as well do it in color. I spent more time getting the lines right, outlining in green with a smaller "digital brush". But I used a big "brush" and opaque color on the background. At the last minute, I added a little extra yellow to the beans. (There were actually both yellow and green string beans growing out in the field, but I really did this because I was thinking of magic beans.) Then I posterized the whole image. So this turned into a digital re-make, rather than just a revision. 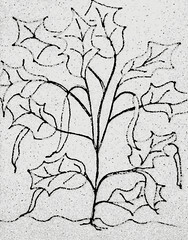 Bean Plant (Digital Woodcut), a photo by randubnick on Flickr. I used Painter to add the woodcut effect to my pen and ink drawing, posted here yesterday. This little drawing of a bean plant was inspired by yesterday's adventure, picking string beans at The Food Project (local CSA). 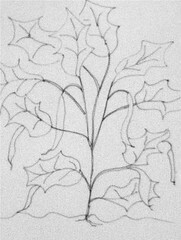 I was drawing from memory and imagination, and found out afterward that the leaf shape is wrong. I still like the drawing, though, but at some point plan to go back and revise the drawing to make it "horticulturally correct". Looking for Beans, a photo by randubnick on Flickr. Today was the day for the weekly pick-up at our CSA (Community Supported Agriculture) over at the Food Project at Long Hill Garden. Most of the vegetables are in bins under a small tent, but sometimes there are things to pick in the field. Today I picked cherry tomatoes and some string beans. There weren't too many beans left by the time I got there, so I had to look hard to find them. Later, after dinner, I decided to draw a little pen and ink sketch of what I had seen, so I grabbed a sketch book and a sharpie. This drawing is the result. After I finished the drawing, I decided to look for images of bean plants on line, and so discovered that although I thought I was looking hard, I wasn't looking hard enough. I was wrong about the shape of the leaves. But I like the little drawing anyway, so here it is. I also used Painter to create a "digital woodcut" version and plan to post it tomorrow. Petunias Again, a photo by randubnick on Flickr. Tonight I made this image in Painter, using a pattern that I "captured" recently from a photo of purple and yellow petunias, taken in early July. I have made a couple of images with this pattern, but tonight decided to have another go. This time, I used a yellow background, and made wavy brush strokes. Then I posterized the result, and cropped it to get this composition. 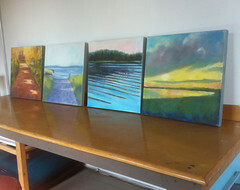 Four Paintings in the Studio, a photo by randubnick on Flickr. Today I went up to the new studio space at Porter Mill. I cleaned up and got the space ready to be seen in time for tonight's event. This was the first get-together for the artists, along with a walk-through of the studios. I haven't had a chance to hang any art work on the walls yet, so I just took out four of my oil bar paintings from a recent show and just put them up on a work table. I liked the way they looked leaning against the wall, so I took a picture. Tonight's get-together was fun and enjoyed getting to know the other artists. It was great to have a chance to see their studios and learn about their art. I think I am going to enjoy Porter Mill. Inspired by Chihuly (Digital Sketch), a photo by randubnick on Flickr. Yesterday, I went into Boston to see the Dale Chihuly show at the Museum of Fine Arts. (I met my cousin there, and she liked the show so much that was her second time seeing it.) We had a great time and we spent several hours looking at amazing glass sculptures and installations. When it was time to leave, I set off for home on the T (Boston subway). Due to the Sunday commuter rail schedule, I had over an hour to kill at North Station while I waited for my train back to Beverly. While I sat there, I kept thinking about the exhibit, and decided to take out my iPhone and sketch with the Brushes app. The kind of art show that I enjoy most is the kind that inspires me to make art myself, and the show certainly did that! It was also inspirational to consider the optimism of a glass-blower who was blinded in one eye (by glass!) in a car crash, and due to a shoulder injury, could no longer blow glass himself. But instead of being stopped by these events, he created a team approach and went on to make huge glass sculptures and larger-than-life installations. But most inspirational, to me: the playful spirit, exuberance, and celebration of life in the exhibit. So that's was what was on my mind in North Station as I got out my iPhone and began to play with my Brushes app. I wasn't interested in replicating anything I had seen (would never dare, anyway). But the show certainly filled my imagination with biological forms, colors, and textures. So I began to sketch one simple biomorphic shape, and then repeated variations of it. I used the different digital "brushes" in the Brushes app to create different textures, and added a dark purple background for contrast. I was just finishing my sketch when they called my train. Tonight I transferred the sketch from my iPhone into my computer, and used my Painter software to do a little bit of cleanup and cropping. This image is the final result, a little tribute to Dale Chihuly, to optimism, and to the inspirational power of art.